Who was Ludwig Manfred Lommel? Lommel was born January 10 1891 as a son of a clothier at a town called Jauer in Silesia (today Jawarow, some pictures you will find here) and lived thereafter in Neukirch an der Katzbach (today Nowy Kosciol). During a commercial apprenticeship in Bremen (from 1908 on), he secretly took acting instructions. Due to this fact his father saw himself forced to send him to Manchester, England, where he had business associates, who held Lommel under strict supervision. But that could not stop him to get across his knowledge of the English language (elaborated in the wool industry) to an audience at a theatre (Prince Theatre in Shaklin on the Isle of Wight). Despite a pseudonym ("Charles Holmes") it went forth and Lommel had to live without the so far already small financial support of the father. Back in Germany he travelled "in fats and oils" (travelling salesman selling all kinds of oil) and used his commercial knowledge. In the First World War Lommel served as a reserve officer, of whom it was said that he was an involved more in amusing than in martial enterprises (he e.g. imitated aeroplane motors for the amusement of his subordinates). Already on April 18, 1916 Lommels first child was born (Lommels wife was named Marguerite). His name was Hans Lommel, who died in 2000 (his wife Trudy is still alive). His second child was Ruth Lommel (born May 6, 1918), who became a well-known German actress in the 1940ies and the 1950ies (see German Internet Movie Database (English) and Kinosessel.de (German). Ruth lives today in Moenchengladbach. Later (on September 1, 1922) Werner Lommel followed, who died in World War II. Coming to Breslau Lommel had the improbable luck that new techniques were given a trial there: The Silesian radio hour had taken up its activity. Thus Lommel for the first time had a large public (whole Germany was broadcasted) and it hit like a bomb, entire Germany was sitting laughing and crying in front of the radio. In the 1930ies Lommel was the most popular German record humorist. He also wrote books, shot films, further played theatres and was theatre manager of the "Großes Lustspielhaus" of Berlin at the Friedrichstrasse for one year (1938), but today hardly nobody knows about it. December 21, 1944 his son Ulli Manfred Lommel was born in Zielenzig (now Sulecin, Poland) by his second wife Karla (Karla Lommel Kerchensteiner lives in Munich, married again after L. M. Lommel died; you can find a German interview from 1982 with Karla here). Ulli already began his career in the show business with four years (see German Internet Movie Database (English)). After appearances in different more or less characterful roles (e.g. under Russ Meyer as director), Ulli Lommel met the director and film producer Rainer Werner Fassbinder in 1969 and followed his actor and production team. While he operated with Fassbinder, Lommel took over acting roles as well as activities as a director, among other things, under the aliases "Damin Bessinger" and "Mario van Cleef". His works rank from brilliantly set in scene dramas to bad B-Movies with few artistic flourishes. Apart from a short romance with Anna Karina Ulli Lommel was married to the actresses Suzanna Love and Katrine Schaake. Since 1980 Ulli Lommel is married to Cookie Amerson (unfortunately the homepage of Cookie Lommel is not available any more, but you can get her books on amazon.com). Ulli Lommel has a large fan community particularly in the USA (also "The World of Ulli Lommel", an English fanpage, is not available any more but if you like to know more about him you can look here and here - both articles are in German). Later (1947) Ludwig's youngest son Manuel followed, who works today as a freelancer cameraman for several German TV stations. 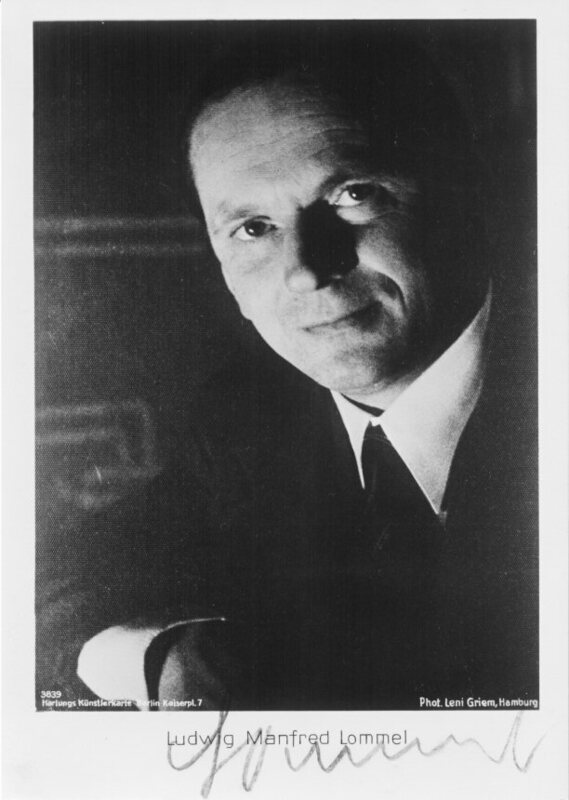 After World War II Lommel gave guest performances as "Hauptmann von Koepenick" at several German stages, acted in the circus, toured around Germany and worked for the Nordwestdeutscher Rundfunk (the predecessor of the NDR and WDR, two german broadcast services). During these times Lommel discovered and promoted some actors which today are still well known in german radio, TV and theatres like Anita Kupsch (* 18.05.1940), Gisela Schlueter (* 06.06.1919, † 28.10.1995) or Ethel Reschke (*24.04.1911, † 05.06.1992); he was on stage for several years with them. After living in Bremen, Bad Nauheim and Berlin Ludwig Manfred Lommel found in Bad Sachsa a new home, where he supported the building of a disabled veteran home and called a relief organization for distressed Silesian compatriots into being. For this Lommel was distinguished with the german medal "Order of Merit 1. Class" on his 65th Birthday. He died on 19 September 1962 during a tour in Bad Nauheim at nearly 12 o'clock by a heart impact. Lommel is buried in Bad Nauheim and the city published an obituary on its homepage (german language).